Eye movement refers to the voluntary and involuntary movements of the eyes that assist with obtaining, fixating and following visual stimuli. The eyes are each connected to a system of six muscles. 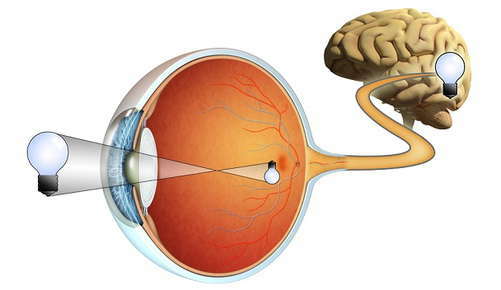 Light is sensed by the retina, which is a type of tissue that contains cells known as photoreceptors. These cells translate light into electrochemical signals that move along the optic nerve fibers to the brain. Once they reach the brain, the signals are interpreted as vision in the visual cortex and the brain applies meaning to what is being seen. And just as the eyes send signals to the brain, the brain sends signals to the eyes. Three cranial nerves transport signals from the brain to the muscles attached to each eye. This ultimately controls both voluntary and involuntary eye movements. If an individual has problems with eye movement, vision therapy is one treatment that can help by using vision exercises and specialized equipment to strengthen the eye muscles, leading to more fluid, cooperated eye movement. Performed under the guidance of an optometrist, vision therapy is conducted in an office setting up to twice a week for an hour. The types of exercises and equipment will be tailored to meet the individual needs of the patient and are based on the severity of the eye movement problem, as well as any associated symptoms. These influences will also establish the number of sessions the patient requires. To accompany in-house visits, the optometrist may also instruct the patient on how to perform certain vision exercises at home. When vision therapy is over, and all necessary sessions have concluded, the patient should be able to perform the four types of eye movement with greater ease and should be more efficient when it comes to processing and interpreting visual information.